Whether you live on a city plot or acres of land, learn new homesteading skills and become better stewards of your land. Attend the Eagle Bluff Homesteading Weekend Workshop and learn how to manage a beehive, graft fruit trees, cultivate mushrooms, or start an organic garden. These workshops have something for everyone. Register for the entire weekend or individual classes. What’s all the buzz about? Join this in-depth beekeeping class to find out! You’ll get an extensive look at what it means to be a beekeeper through a presentation and hands-on learning. You’ll have an opportunity to work with hives (minus the bees). The first half of the day will cover beekeeping terminology, biology of bees, pests and diseases, and beekeeping equipment. The second half of the day will include buying bees, hive and pest management, winter preparation, extracting honey, and working with beekeeping equipment. At the end of this class you will have a better understanding of what it takes to be an effective beekeeper. Instructors: Chris Schad (The Bee Shed) – is a biologist by training, with several peer-reviewed papers published in scientific journals. Several years ago he turned his attention to prairie restoration and other ways to support local pollinators such as honey bees. He manages bees on his rural Rochester, MN property plus on other sites in the region. John Shonyo (The Bee Shed) – has been beekeeping since 2009 in Oronoco Township. Up until the merger with The Bee Shed he owned and operated Bee’s Knees Honey Farm. He has been a honey bee advocate giving presentations to community groups, schools, and service organizations about how important the honey bee is to our food supply and what people can do to help keep a healthy bee population. Includes 3 classes - All day Beekeeping class on Saturday, March 9th and a morning and afternoon class on Sunday, March 10th. Also includes lunch on both days. Includes materials fee. 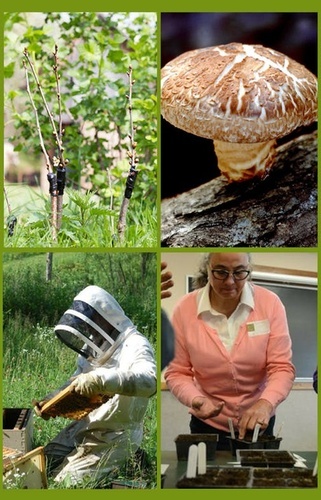 Includes 3 classes - Grafting either the morning or afternoon of Saturday, March 9th and the morning Beginning Organic Gardening and afternoon Shiitake Mushroom Cultivation classes on Sunday, March 10th. Also includes lunch on both days. Includes materials fee. It is $50/person to stay in our dormitory style lodging at Eagle Bluff. Linens are included in this reservation. A multi-person room contains beds to accommodate up to 4 people, with a shared shower, bathroom and sinks.